Purchasing a car unlocks the open road, and with that, a whole new world of possibilities. Your vehicle may give you a sense of freedom, but it can also trap you in debt. An automobile purchase is one of the largest investments in many consumers’ lives. It should be done carefully and with the proper research. An important tip to remember is never to grow overeager. By doing so, you may find yourself making poor decisions like putting your down payment on a credit card. This may seem like an easy and quick solution, but it has a high probability of being a financial disaster. It doesn’t take long before credit card debt takes over your life. A few quick purchases can bring high monthly payments and oppressive interest. The risks are increased even more so with incredibly large charges like a down payment on a car. Personal credit cards often come with very high APR between 12.54% and 16.32%. You can avoid any damage if the full balance is paid off every month. If you don’t plan on paying the entirety of the down payment credit card charge in that time, you will quickly raise the overall amount owed. For these reasons, using a credit card for your car down payment is not recommended. Fortunately, there are other options. The best option for a car down payment is cash. This no-brainer solution helps you avoid any loans and interest rates. Obviously, this option is not for everyone. The immediate need for transportation can surpass your savings account. If this is your situation, a car loan is your best bet. 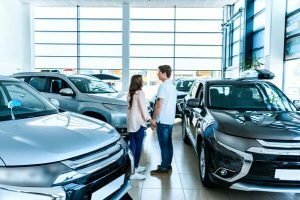 Car dealerships offer competitive rates, but do your research to guarantee you’re getting the best deal. Financing your car and down payment with a car loan from a credit union is a superb option. This is more attractive than using your credit card because credit unions can offer a much lower interest rate (around 6%). As stated earlier, CreditGUARD does not recommend making a down payment using a credit card. If you fall behind on your credit card or car loan payments, CreditGUARD’s team of certified credit counselors can help you navigate this difficult financial situation. Our debt reduction and financial education programs will give you the keys needed to turn around your debt. Call us today at 1-800-500-6489 to start your new financial future.